Knowing first-hand how a proper home inspection should take place is vital to ensuring that the home you are about to invest in is safe. From checking the foundation, down to inspecting the rafters in the ceiling, our real estate inspectors will check every nook, cranny and angle of the home. There are several key characteristics that you should look for upon your initial walk through of the potential sale. Pay close attention to window sills, checking for any current or pre-existing moisture spots. This could be a sign that there may be some integrity issues surrounding that window. Though it may not be too noticeable, there could be huge underlying consequences. 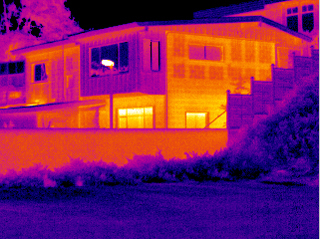 With the use of thermal imaging, Ingraffia Home Inspections will check for any areas that may be releasing the energy that you are pumping into your home via HVAC, AC or heating system. If leaks are found, it is best to have the seller fix these items using a contractor of YOUR choice, or negotiate the repairs in the final asking price of the home. You never want to assume that repair costs will be minimal based on a basic visual inspection.